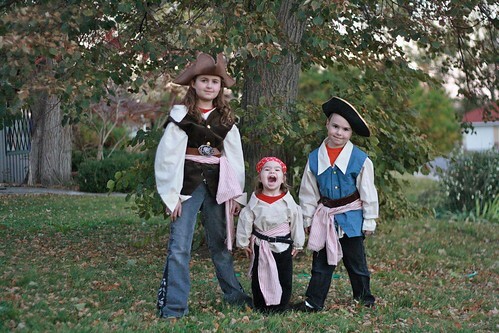 Arr, tharr be pirates, ye scoundrels! 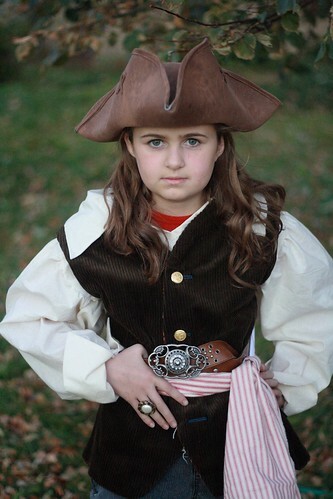 I think it's interesting to observe how the popular image of what a pirate looks like has changed since I was a little girl. 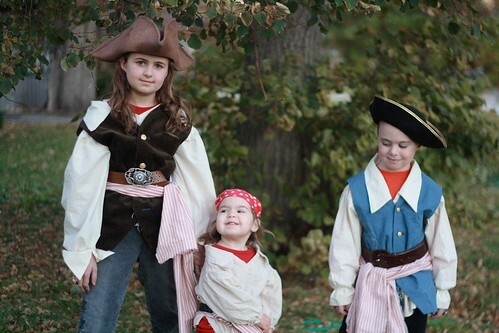 I realized, as we were out trick-or-treating, first in our small downtown's trick or treat street, and then later in our own neighborhood, how much the "look" of a pirate has been influenced, for better or worse, by Captain Jack Sparrow. 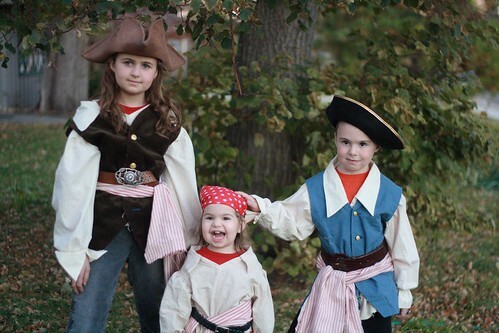 I think that even children who haven't seen the movies (as I presume most little ones haven't) think of a pirate as looking that way, with the belts and the sash and the rings and so on, as opposed to my childhood image of pirates, which was perhaps a bit more Mr. Smee in nature. 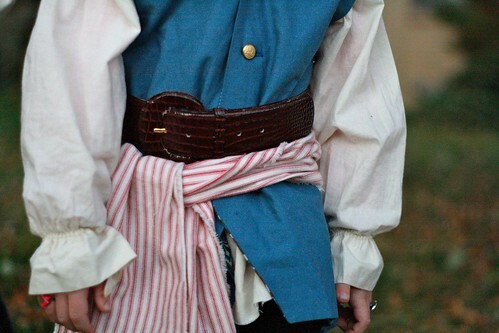 Anyway, when we began discussing what costume elements were absolutely necessary in the pirate costumes, the first things to come up (besides the hats, which we already had in our dress up bin) were the belts and sashes. These costumes were the easiest I've made in my Halloween costume-making career (which is quite extensive -- these brought my costume-making tally up to 19!!). I only had to sew the shirts and the vests. (Fiona didn't get a vest because, frankly, I didn't think it would have much dress-up play value and didn't seem absolutely necessary. She certainly didn't care.) I tore the fabric for the sashes, and we got pants and belts at the thrift store. They also each wore a couple of rings. Elisabeth had one costume ring, but the rest of the rings were fashioned with large buttons and pipe cleaners! Shirt "un-pattern" here. 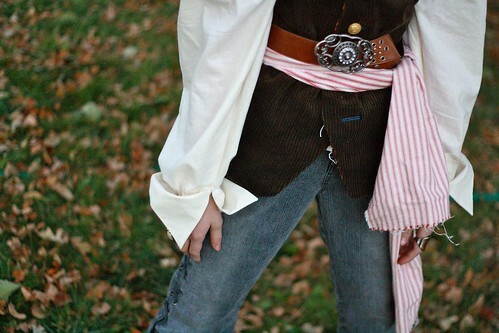 I used an old sheet for Fiona's shirt, and some muslin I had in my stash for Elisabeth & James's shirts. I did the collars and cuffs slightly differently on each shirt, and can't really say which turned out best. They're all different, I suppose. Vest "un-pattern" here. I didn't love the way I drew the bottoms of my vests, but I threw them together at the last minute because the kids decided after trying everything on with the shirts that something was missing. I wish I had taken a bit more time with the vests, but they look fine for Halloween costumes. I used the idea suggested on the Wee Folk Art site to make it seem like there is a missing button. I tied some string on the button side and the buttonhole opposite it is non functional. Elisabeth's vest was made out of some corduroy I'd had for several years and James's was made with some linen that I got for a song years ago, as well -- I had maybe 10 yards of it just going unused! What an odd purchase. They are both lined with this fantastic, funky vintage fabric that I got from Jodi, also ages ago. (I need to get some pictures with the lining showing, it's so great.) The buttons are some random "brass" buttons I had in my stash, probably cut off of blazers at some point. Altogether, the vests are my favorite part of the costumes. The idea for the rings out of buttons and pipe cleaners was also from this site! 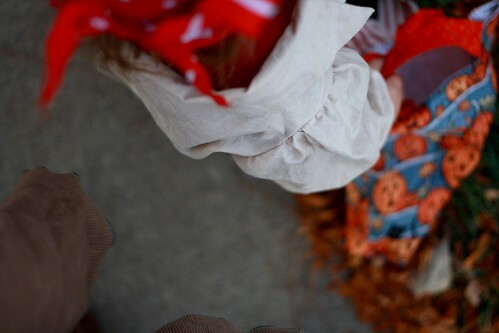 It was very useful in fashioning our pirate costumes this year! Edited: Oh, gosh, and I almost forgot one of the best parts of this story. I sewed several of these costume pieces with a kitten sitting on my shoulder. That's right, mateys, I have a kitten parrot! Once again, we were delighted to have fun, homemade costumes as part of our celebration. (Just a bit more about Halloween tomorrow, too!) What about you? What kind of costuming did you do this year?